With two teams that like to shoot the 3-ball, you would have thought that a Cheverus - Bonny Eagle match-up would be high scoring. Not when you can't hit the 3-pointer. Cheverus made one more 3-pointer, and that was the final margin as the Stags downed the Scots 30-27 to win the Western Maine Class A Boys title. Cheverus got off to an 8-2 start, as Bonny Eagle was cold from the field to start. Louis DiStasio and James Kapothanasis both hit 3s for the the Stags. It was 8-4 Cheverus after the first quarter. Bonny Eagle would end the first and start the second on a 5-0 run, with Freshman Dustin getting a basket and a free throw to start the second quarter. The teams combined for 10 field goals in the first half, as turnovers and clanked shot attempts were the telling tale. Cheverus held a 15-9 lead at halftime. Bonny Eagle would pick up the offense in the third quarter. Four different players would score for the Scots, with Levi Meggison scoring 4 points. DiStasio paced the Stags with 4 points of his own, as he also battled foul trouble. Meggison would get a put-back at the buzzer as Bonny Eagle was only down 22-21 heading into the fourth quarter. The fourth quarter was quiet until the last two minutes, when the teams finally woke up. 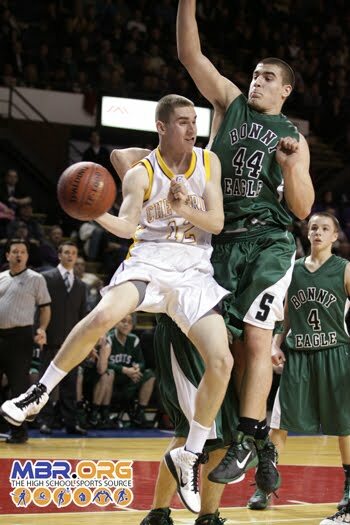 Steve Simonds and Cole hit back-t-back 3s as Bonny Eagle took their first lead of the game. Griffin Brady would hit a 3-pointer to put Cheverus back on top with under a minute to go. Connor O'Neil would hit a free throw to push the lead to 3 with time winding down. Simonds missed a game-tying 3, and Meggison was called for traveling trying to take the rebound outside the arc as time expired. DiStasio was named the Capt'n Eli's Player of the Game after leading all scores with 11 points. The Stags will now head to the Augusta Civic Center to play for the Class A Boys State Title on Saturday.